For regular users, having a silent application that constantly updates the browser is a good thing. There's no annoying interface that interrupts you to ask your permission before updating the application and you no longer have to manually check for updates. Unfortunately, Google Chrome's automatic updater is not a great feature if you have limited bandwidth or in an enterprise environment, since you can't customize it. Now you can use the Group Policy Editor from Windows or add some Registry keys to customize Google Update. 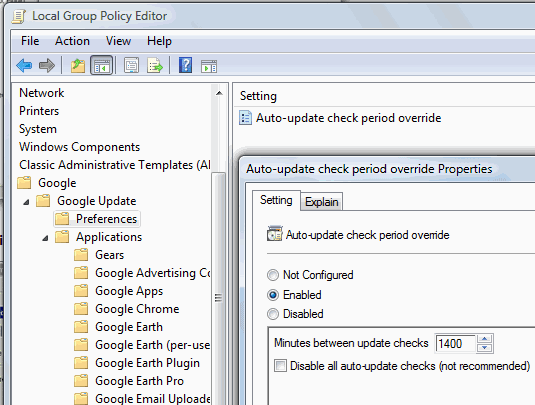 Google Update for Enterprise explains how you can import an administrative template in the Local Group Policy Editor (gpedit.msc) and change the auto-update check period or even disable the auto-updater. You can configure separate policies for different Google applications, allow only manual updates and even prevent the applications from installing on your computer. DisableAutoUpdateChecksCheckboxValue - 1, if you want to disable the auto-updater; 0, if you want to enable it. "We work hard to keep our users safe and secure when using our applications, and we believe that making sure users have the latest software available using automatic updates is a key component of that. However, we realize that there are situations where automatic updates may not be desirable so we wanted to provide the ability to control updates when necessary," says David Dorwin, from the Google Update Team. May 16, 2009 by Ben Pike.